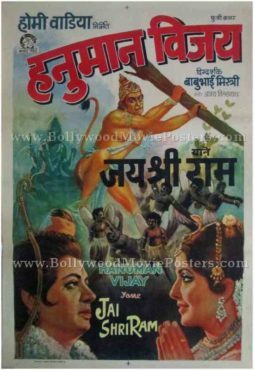 Vintage Indian mythology poster for sale of the old Bollywood movie, Hanuman Vijay Yane Jai Shri Ram (1974). This is an actual surviving old Bollywood poster for sale of the 1974 Indian mythology film that was produced by Homi Wadia and directed by the pioneer of special effects in Indian cinema, Babubhai Mistry. This Indian mythology poster was originally designed and printed for publicity of the first release of the film (somewhere in the early 1970s) but never ended up being used. Hanuman Vijay was an Indian mythology film that chronicled the story of Lord Hanuman. This Indian mythology poster was originally hand painted on canvas by a leading art studio in Bombay. Lord Hanuman is seen prominently in the center carrying a tree in his hands. Beautiful hand painted portraits of Lord Ram and Sita are seen at the bottom of this Indian mythology poster. 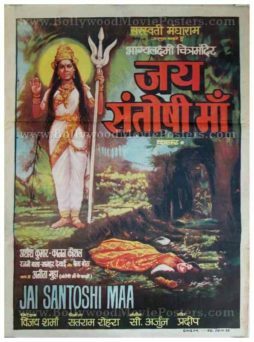 Old Bollywood poster of the blockbuster Hindi film, Jai Santoshi Maa (1975) for sale. This is an actual surviving vintage Bollywood poster of the 1975 underdog film (made on a low budget with forgotten stars), which emerged as a blockbuster. Jai Santoshi Maa was one of the highest earning films of 1975, sharing the spotlight with the likes of blockbusters Sholay and Deewaar (both of which find mention in the list of greatest Bollywood movies ever made in Indian cinema). The film enjoys the coveted title of being one of the most successful devotionals ever made in Bollywood. Such was its craze that it is believed to have turned cinema halls into “temporary temples.” Viewers entered cinema halls minus their footwear, carrying flowers as an offering for the goddess and bowed down in reverence each time she appeared on screen. Such level of obeisance was never previously seen for any other devotional film made in Indian cinema. Printed and circulated during the first release of the movie (somewhere in the mid 1970s), this old Bollywood poster was originally designed for publicity of the film but never ended up being used. This old Bollywood poster features an interesting hand painted design depicting Goddess Santoshi, the goddess of satisfaction. Jai Santoshi Maa is a 1975 low-budget devotional Bollywood movie that became one of the top blockbusters of the year. Usha Mangeshkar, sister of Lata Mangeshkar sang devotional songs for the film. The unexpected success of the film surprised film critics. 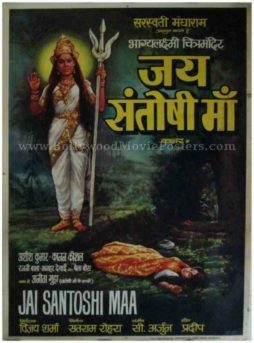 In an era dominated by the action genre aimed primarily at urban male audiences, Jai Santoshi Maa was primarily targeted at women (chiefly in rural areas). It is believed that after the release of the film, the number of worshippers of goddess Santoshi increased exponentially, particularly in Northern India, with thousands of women observing the Santoshi Mata “vrat” or fast. Old hand painted Bollywood poster of the blockbuster Hindi film, Jai Santoshi Maa (1975) for sale. Printed and circulated a few years after the first release of the movie (somewhere in the late 1970s), this movie poster was originally designed for publicity of the film but never ended up being used. This old Indian Hindu mythology poster features an interesting hand painted design depicting Goddess Santoshi, the goddess of satisfaction.